This article is largely a how-to on extending your gardening season. Unfortunately, it’s coming out a wee bit late for 2015, but hopefully you still have a number of crops in the ground or raised garden bed that can be harvested into the winter. And you can put it on the fridge for 2016, because planning for winter and early spring vegetables is key if you want an extra month out of your garden. There are two primary factors to consider when extending your garden season, either in the fall or spring: day light hours and temperature. More or less of one or the other will determine whether or not fall-planted crops will mature enough to harvest or store over winter, and how fast they will grow once spring hits. If you live in Williams Lake proper, you are lucky: we have a forgiving growing season that can start as early as March, and thrive into late September or October. What is also beneficial is that we still have a fairly reliable snow cover during the winter, which is actually better for overwintering plants than extreme cold temperatures without snow. But let’s look at those frosts first. You’re an avid gardener and you’d like to have carrots, for example, right into December. Or start salad mix in the last week of March. Williams Lake is considered a Zone 5b (plant hardiness) with last frost dates (www.plantmaps.com/interactive-british-columbia-last-frost-date-map.php) somewhere between May 21-31, on average. But two things are important to remember here: the first is that these frost dates are based on 0 degrees Celsius, or just slightly lower. But many plants can handle – and even improve at – lower temperatures than that. The second is that there are a number of season extension tools you can use to mitigate those lower temperatures when they do occur: low tunnels, row cover, supplemental heat, etc. There is another threshold that is known as “killing frost.” This is a temperature of around -2.2 degrees Celsius. Using this threshold to determine first and last frost can add weeks to our growing season, if we’re talking about anything other than tomatoes, squash, beans, or other heat lovers. That leaves a lot of options! Now, of course, if you transplant a four-week-old kale plant in mid-March, uncovered and without hardening off, and there is a slight frost, it might not make it because it hasn’t been conditioned or developed a sturdy root system. But in the last weeks of July, you can put out more kale transplants in preparation for fall and winter harvest because it will have enough time to develop enough foliage and root system to handle the cold. After you’ve determined which plants are hardy enough for our region, (lots are listed here: www.almanac.com/plants/hardiness-zone/5) timing all comes down to day length and heat units. In Eliot Coleman’s Winter Harvest Handbook, he determines from his own farm research that plants stop significant growth if there are fewer than 10 hours of day light. But this doesn’t mean they’re dead. Far from it: Coleman also considers winter food production as a shift from planting to harvesting. As long as you’ve planted your crops with enough time to develop before winter, and added protection, they’ll keep growing at incrementally slower rates, until the halt of winter, then pick up again in the spring. If you want to keep those carrots in the ground, for example, and harvest them into the winter, they will actually taste better as the freezing temperatures turn starch into sugar. But if you just leave them in the ground, they will turn to mush, and the reason for this is moisture. Using the aforementioned season-extension tools, such as low tunnels and mulch, those carrots will stay dry and delicious. You need to plant them with enough time to mature, so look at the DTM (days to maturity) of your carrots, and count back from around the last two weeks of September, when temperatures and day length drops. Once they’re mature, you stop watering, and mulch and/or put up a low tunnel to keep moisture off. Using a pitchfork and waiting for a sunny November day, you should be able to harvest those carrots. There are so many possibilities with season extension in Williams Lake and the Cariboo, and this only scratches the surface. But as climate changes occur here, and winters are reportedly much milder than in the past, it is worth experimenting to add to what is already an impressive local food system. With season extension tools and storage infrastructure, we have a lot of potential, both on a small scale in your own garden, or on a larger scale in greenhouses and root cellars on local farms. The Williams Lake Food Policy Council would love to see more of this. We have almost completed our greenhouse construction at the Memory Garden on Carson St., and hope to experiment more with overwintered crops in the future. But in the meantime, if you’d like to learn more about season extension, we are facilitating a workshop for the Williams Lake Garden Club (www.facebook.com/groups/379734715469186/) on October 1, at 7 p.m. in the CCACS building (old fire hall). There is a $2 fee for drop-ins. We’ll talk more about timing your fall and winter plantings, and how to get started super early in spring. If you are already a community gardener, or would like a bed at the Memory Garden on Carson, deadline to register is October 31st, 2015. Send us an email for a gardener’s agreement at: foodpolicycouncil@hotmail.com. 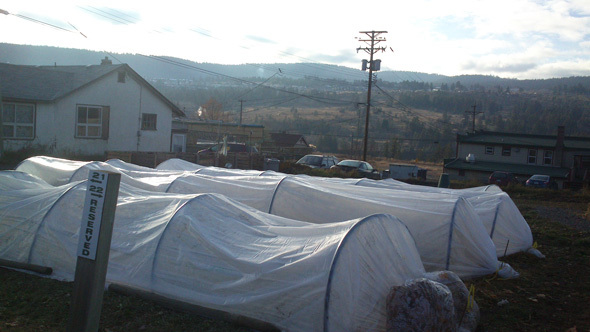 Brianna van de Wijngaard is one of the Williams Lake Food Policy Council’s Food Action Coordinators, assisting in community garden maintenance, education, and expanding local food security.